The Annual service of remembrance brings the families and friends of the 96 men, women and children who were killed at Hillsborough to Anfield each year. (95 died on that day and one later). The thousands, who attend the service, fall silent at 3.06 on the 15th April. It was the exact time that the referee at the FA Cup semi final stopped the match between Liverpool and Nottingham Forest on that faithful afternoon in 1989. It is a symbolic, moving and painful moment. For those on the Leppings Lane terrace it was a matter of life and death and for those family and friends, many watching the game, it was the beginning of a long nightmare. Phil Scraton in his excellent book…….. “Hillsborough……. the truth” has identified why this disaster was different from many others…. This compounded the tragedy for the families and friends and for the people of Liverpool, the fabrication of the truth in the infamous Sun newspaper on 19th April, the terrible insensitivity of the authorities, the taking of blood alcohol levels of the dead, even of the children, the pursuit of “enemy within” by British Prime Minister Margaret Thatcher, the failure of the legal and administrative processes and most of all the cover up by many officials who walked away from their responsibility. Football hooliganism was to Thatcher part of the enemy within and some of the police operated a policy of force and coercion when it came to football fans. But it did not stop there…….basically the figure of blame was placed on the supporters and the people who died. A miscarriage of justice does not even begin to describe what took place. As people struggle to cope with bereavement and everyday life in the aftermath of the loss of a loved one, they have to believe that the authorities, investigative and legal work to establish the truth of what happened and who was responsible, they depend on the law. Lord Justice Taylor was appointed by Douglas Hurd to conduct a Home Office Inquiry into the disaster, the Inquiry opened on 15th May and made an interim report on 1st August 1989. Taylor found that hooliganism played no part in the disaster. The real cause was the overcrowding and the failure of police control. The South Yorkshire police had been responsible for the match security at Hillsborough. He castigated senior officers of the South Yorkshire police and commented on the police orchestrated campaign against the Liverpool fans. The South Yorkshire Police had form when dealing with ordinary workers and miners during the 1984-85 Miners strike. The South Yorkshire Police really never accepted that their mismanagement of the game had been the primary cause of the disaster. There were numerous oversights and mistakes by Taylor including the failure to question the FA’s decision to use Hillsborough, the Sheffield’s club failure to sort the bottleneck that was Leppings Lane and the medical care administered at the ground in the immediate aftermath of the tragedy. However his main findings that the police were responsible were important. The South Yorkshire Police settled some compensation claims for very low amounts and treated the matter as being closed. The West Midlands police were appointed to oversee the criminal investigation into Hillsborough and submit a report to the Director of Public Prosecutions (DPP). The West Midlands Police also had form…..they were responsible for the conviction of the Birmingham 6 who spent 16 years in prison before forensic tests revealed that parts of their statements had been fabricated. It later emerged that this unit had habitually fabricated evidence in previous years. Next were the inquests into the deaths. In the coroner’s court the objective is to establish the medical causes of death, to establish the circumstances of the deaths, the how, but it is a how without blame and without liability! The West Midlands Police had still not collected all the evidence for the DPP but it was decided to proceed with mini inquests, which with typical insensitivity began on 18th April 1990 in Sheffield Town Hall. Only the West Midlands police offices could make a statement about each of the victims, nothing else could be said. It was described as a circus by many of the families. A pathologists evidence, , blood alcohol levels were read out, a policeman giving details of the deceased, no questions allowed, facts incorrect, a conveyer belt for grief stricken families. The families were left completely disillusioned with the process. On 30th August 1990 the DPP decided there was no evidence to justify any criminal proceedings, so the police and all others were effectively cleared and no reason was given. The inquests resumed on 19th November 1990 and continued until 28th March 1991. The survivors had no legal representation; the bereaved had to finance their own legal representation. The Coroner Mr. Popper decided that there was to be a cut off time of 3.15 on 15th April 1989. So anything that happened after 3.15 at Hillsborough could not be considered at the inquest. He also selected the witnesses, and also decided that the evidence given to the Taylor inquiry could not be used, but its findings could be challenged. One barrister represented some of the families and survivors (paid for by just 43 of the families), 6 lawyers represented the different police sections, and many survivors were grilled in cross examination by these lawyers. Many survivors were left feeling as if they were responsible for what happened. On 28th March 1991, after 80 days of hearing the jury decided on an “accidental death” verdict. Many considered that the coroner had in effect left the jury with no choice after his summing up. This was followed by the Police Complaints Authority PCA ended disciplinary proceedings against two senior police officers, David Duckenfield and Bernard Murray. A challenge to the inquest decision was rejected by the Divisional Court on 5th November 1993. Although it was covered by the Cook Report on TV and debated in Parliament, nothing much changed. Attacks by Brian Clough and Sir Bernard Ingram, Margaret Thatcher’s Press Secretary added to the distress. But people in Liverpool did not give up; the Hillsborough Project published “No Last Rights” which detailed the gross injustice of what happened. However many in the media had moved on and the initial perception created by the police, the authorities and sections of the media persisted. In 1996, Jimmy Mc Govern then made “Hillsborough”, a two hour drama documentary which aroused national interest and openly questioned the conventional wisdom. This encouraged the Daily Mirror to run stories with the headline “Hillsborough; The Real Truth”. The new Labour government was elected on 1st May 1997. Jack Straw, the Home Secretary met the families and indicated that the evidence would again be scrutinized. Lord Justice Stuart-Smith was appointed to do so and sought “fresh evidence’. However in spite of meeting some of the families, the terms of reference basically ensured little progress was made and Stuart Smith confirmed the existing position and this was endorsed by Jack Straw in February 1998. Yet not all the records had been made available, it came to light that some of the police officers written verbatim accounts of what had occurred had been changed, re written, doctored, edited, some police officers began to talk openly about the events at Hillsborough, and gradually the picture of many altered recollections and statements showed that a cover up was underway within hours of Hillsborough. A private prosecution of Bernard Murray and David Duckenfield had been taken by some families and the trial commenced in June 2000. On the 21st July the jury found Murray not guilty and could not reach a verdict in the case of Duckenfield. The summing up by the judge Hooper was a major issue and the evidence was for a particular period of the day only; limited to events between 2.30 and 3.06. No retrial of Inspector Duckenfield took place. How did the parents and survivors cope with this latest setback, no truth and no justice, Every institution had failed them, failed publicly and contributed to the torment of injustice. The campaign continued, the Hillsborough Family Support Group played a leading role in ensuring that the issue never disappeared. 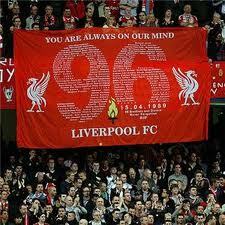 The Kop regularly chanted Justice for the 96, while Anne Williams took a case to the European Court of Human Rights in 2006. In 2009 this was rejected as being out of time. It would not go away, and did not go away. The Hillsborough Family Support Group campaigned along with many others to highlight the injustice at every opportunity. In 2009, at the 20th Anniversary of the disaster, a further expression of vocal and moving support at the Remembrance from the thousands in Anfield in front of Andy Burnham, Secretary of State for Culture, Media and Sport, made such a public impact that the 30 year rule on disclosure of documents was waived in respect of the disaster. The Hillsborough Family Support group met again with the Home Secretary and finally in January 2010, the Hillsborough Independent Panel, chaired by James Jones, Bishop of Liverpool was appointed. Finally on September 12th 2012 this Panel finally established and published the truth, it basically confirmed what the Hillsborough Family Support Group, survivors, the families and the people of Liverpool had known for years. The report established among many other facts that the medical evidence was wrong, that many of the victims were alive after 3.15pm and with a reasonable medical response, up to 58 people might have been saved. Anne Williams an amazing woman who had campaigned for years and who lost her son Kevin at Hillsborough died of terminal cancer on 18th April 2013. She had been diagnosed just after the Independent Panel report in September. On 19th December 2012, the High Court quashed the original accidental death inquest verdicts. New inquests have been ordered. Jon Stoddart a former Chief Constable of Durham Police has been requested to lead a new criminal inquiry. Bill Kenwright, Everton Club Chairman, probably summed it up when expressing solidarity with the parents fight for justice….”They picked on the wrong city – and they picked on the wrong mums”. 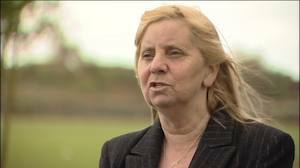 Liverpool mums such as Margaret Aspinall, Chairperson of the Hillsborough Family Support Group have ensured that the full truth of this disaster will be exposed for all to see and the systematic institutional failures which led to the disaster and cover up will be laid bare once and for all. The fight for justice goes on and on. You can hear a first hand account of the long struggle for the truth at the Spirit of Mother Jones Festial in Cork on Tuesday, 30th July 2013. Margaret Aspinall, Chairperson of the Hillsborough Family Support Group accompanied by Sue Rogers will speak on………. “Hillsborough…..the torment of injustice”…….. on Tuesday 30th July at 7pm at the Firkin Crane Centre . Margaret will then be presented with the Spirit of Mother Jones Award 2013 at the end of the meeting.